December 1st will mark the third time that the Manhattanville community is joining the celebration of #GivingTuesday, a day dedicated to promoting and encouraging giving during the annual shopping and spending season. #GivingTuesday 2014 saw over $45 million raised by 26,000 organizations in 68 different countries. This #GivingTuesday, we are offering alumni the opportunity to dedicate all or part of their gift to the Adopt-A-Suite project! During Reunion 2014, an alumna from the class of 1969 suggested that we add some color to dorm rooms, and over the past year and a half that notion grew from a suggestion to a reality. The Adopt-A-Suite project is one that “has done wonders for students building a sense of pride in where they live,” according to the Director of Residence Life, Benjamin Grant. Both Dammann and Tenney Halls have seen major renovations which include new furnishings and vibrant shades of red, yellow, green, blue, and orange accent walls. 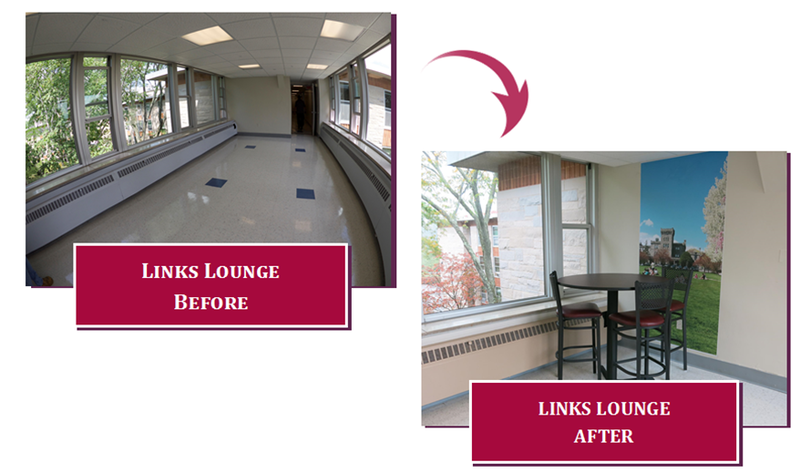 In addition, bar tables, stools, and two floor-to-ceiling posters were placed in the links lounges, which connect each of the cubes to create appealing, usable mini-lounges. In order to expand these updates in Dammann and Tenney Halls, we need your help. As a member of the Manhattanville community, you are a part of our history and our future, and we want you to be involved as we seek ways to enhance the overall Manhattanville experience! Supporting the Adopt-A-Suite project will allow additional updates and renovations to be made in the residence halls and will continue to brighten and reimagine the living spaces to enrich the experiences of current and future Valiants. Cube Sponsor – Enhance the common areas with vibrant colors! Suite Sponsor – Join your suitemates in adopting the suite you called home during your time at Mville! Links Lounge Sponsor – Reinvigorate the links lounges with vibrant posters and new furnishings! By giving to the Adopt-A-Suite project this #GivingTuesday, you will help the College improve features on campus and enhance the day-to-day lives of our students. Your generosity will be recognized on a list of donors displayed in the lobby of the dorm of your choice along with the suite number from your time as a student. With fresh paint colors and updated décor, our students are truly taking pride in where they live. On December 1st, in the spirit of Thanksgiving and the upcoming holiday season, please take the time to donate to your alma mater and join countless others in supporting #GivingTuesday. Give to the Adopt-A-Suite Project, today!